San Pedro de Atacama, Chile. Getting there. Here at the Ginger Travel Guru, we’re big fans of South America, it’s one of my favourite places to go with some incredible sights, and I know that I’ve only scratched the surface of the continent. A few years ago, one of my all time favourite trips was to the Atacama desert in northern Chile. It’s not an easy place to get to, the closest airport is a place called Calama (CJC is the airport code) and from there it’s a ninety minute drive to San Pedro itself. 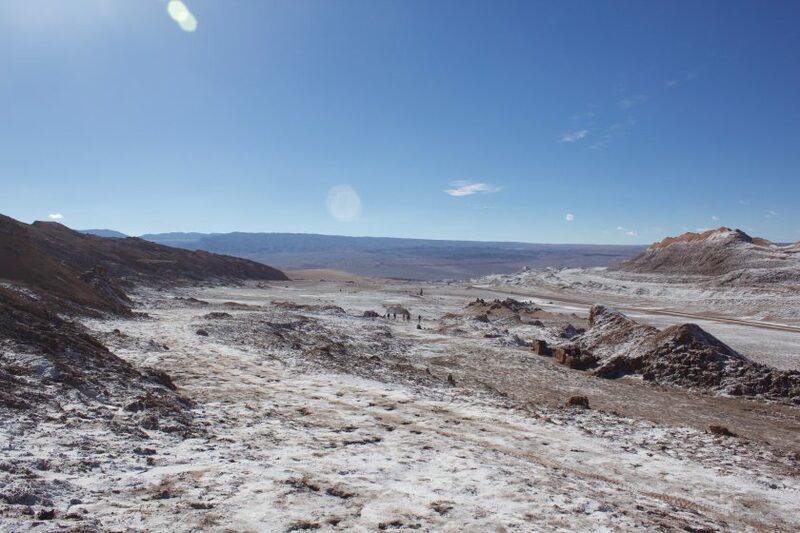 Calama itself is a mining town, so there’s no real reason to visit it. When I travelled to San Pedro, there were a number of options from the UK, however both involved two connections; now it’s possible to do it one. If you want to stick to oneworld, there’s essentially three main options with two connections. British Airways flies five times a week to Buenos Aires, and then you can connect on LATAM to Santiago, and then from there a domestic flight to Calama. Alternatively, you can fly Iberia from London to Madrid, from there to Santiago and then up to Calama. A third option is with American Airlines from London to either Miami and Dallas, and then down to Santiago and back to Calama. For the past six months or so, British Airways have been running a direct service from London to Santiago, currently the longest route in their network at 11,600km (7,200mi) and weighs in at 14 to 15 hours depending on the winds. They fly their newest 787-9 Dreamliners on the route however they do charge a premium for the non-stop flights. For that length of flight, you’ll want to go either business or first class. If you’re a gold member with British Airways that get to either 2,500 or 3,500 tier points every year, it’s also an excellent use of one of your upgrade vouchers. Business class can be had for as little as £1,800 return (starting in Amsterdam) and using one of these vouchers your flights can then be upgraded to first, pending availability. The flights from Santiago to Calama are very cheap and return flights can be had for as little as £60 with either LATAM or the Chilean low-cost carrier, Sky Airlines. 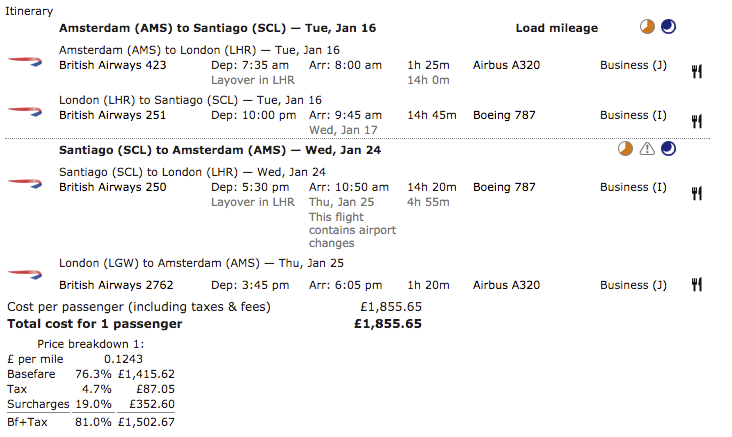 It’s worth booking these separately, but leaving enough time to connect at Santiago between the domestic and international legs. If you’re planning a long way in advance, then some of the schedule may only be firmed up six months ahead. So it’s worth looking a little closer to departure. Santiago airport itself is pretty small and connections are fairly easy. When doing an international to domestic connection there, you need to enter the country, collect your baggage and go land-side. Re-checking bags is fairly simple at the multitude of desks, followed by re-clearing security. The domestic portion of the terminal though is pretty rubbish. If you’re a oneworld emerald or sapphire, there is no lounge available to you. There is one that is accessible to Priority Pass holders, but it’s pretty rubbish. There is a Starbucks in the domestic area to make the wait more tolerable. Going the other way, the LATAM (formerly LAN) lounge is really excellent. They have a good selection of food and drinks, including normally an outstanding red wine or two. 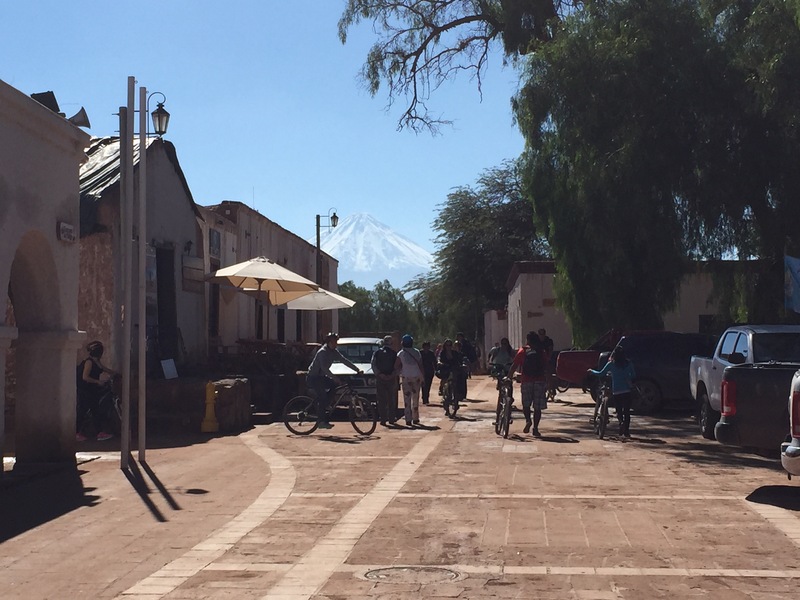 Once you’ve managed to get to San Pedro de Atacama, I guess you’re wondering what the point of going to the driest place on the planet is? Being an urban gay, I guess I’m not the most outdoorsy type (I’m not one for camping for example), but places like this, a bit like my recent trip to Bolivia, fascinate me. I booked a private, English speaking guide through Cosmo Andino and they were really excellent. In San Pedro itself there’s a huge variety of accommodations from cheap hostels, to the all inclusive five star, Awasi resort, with price tag to match. During my visit, I stayed at the mid-range, 4* Hotel Cumbres, which was lovely. The staff were super friendly, the food was excellent (I booked half board), and the rooms huge. We even had an outside shower as well, which had the sun first thing in the morning. It was fully walled off, so completely private. San Pedro itself is pretty touristy, but not completely over-run, but it’s pretty much there to serve the people visiting the near by attractions. It does have a pretty town square and an incredible view of the mountains surrounding it. Over the next few days I’ll be posting a few of the best photos from the trip in various articles. Stay tuned. Next Post: In Pictures. Valle de la Luna, Chile.